What is a DS 11 Form? A DS 11 form is related to passports. What is a DS 11? A DS 11 form is a passport application form. It is used by the U.S. Department of State. 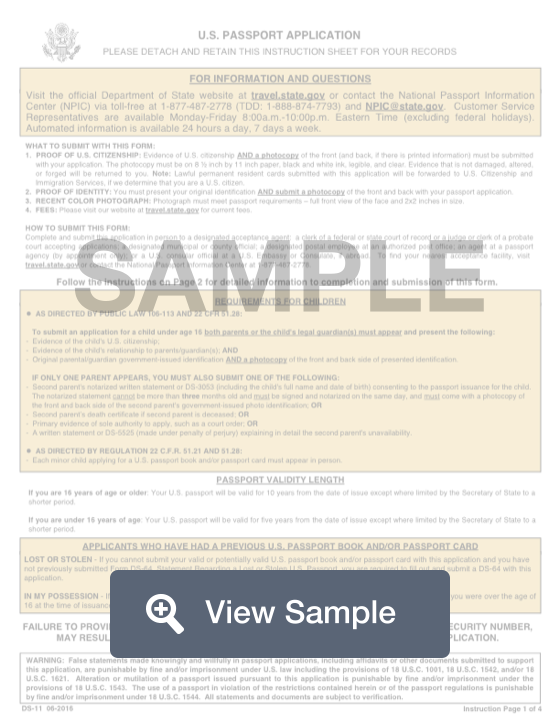 This form is called the "U.S. Passport Application," and should be used by United States citizens and non-citizen U.S. nationals who are applying for a new passport for the first time. Other people who may use this form are people who have only had a passport issued before the age of 16, people whose passport was lost or stolen, people who have had a name change, and people who had a passport issued over 15 years ago. Additional documentation will be required when you apply for a passport. In addition to this completed form, applicants will need identification documents, such as their birth certificate, social security card, or driver's license. To submit and application for a child, both parents of the legal guardian(s) must appear and bring proof of U.S. citizenship of the child, evidence of relationship to the child, and present the parental/guardian government issued proof of identity and a copy of the front and back of the identification. If only one parent appears, you must also submit a form DS-3053 or statement of the non-applying parent consenting to the passport issuance. Applying for a passport is not free. There will be a fee to process the application. Applicants will always need to submit an appropriate photograph for their passport, or they will need to have one taken. If you are looking to renew a passport, you should use Form DS-82 instead. Create a free DS 11 Form in minutes with our professional document builder. You will have to sign and date the application in the presence of the acceptance agent: a clerk of a federal or state court of record or a judge or clerk of a probate court accepting applications; a designated municipal or county official; a designated postal employee at an authorized post office; an agent at a passport agency (by appointment only); or a U.S. consular official at a U.S. Embassy or Consulate, if abroad. To find your nearest acceptance facility, you should visit: travel.state.gov. The processing time is normally 6-8 weeks. You can requested expedited processing for an additional fee. Current fees are listed at: travel.state.gov. If you have additional questions about the DS-11 new passport application form, you should visit: travel.state.gov.